A one of a kind therapy that works to restore the skin on the chest and neck. While much attention has been focused on minimizing aging on the face, many women have neglected the delicate skin on their décolletage. 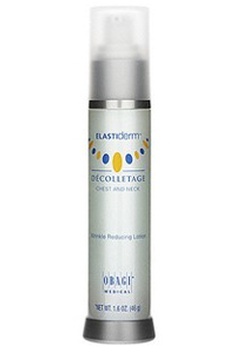 The ELASTIderm Décolletage System is a unique solution for the aging décolletage. It has been specifically designed to give your patients the tools they need to rejuvenate the natural extension of their overall look with a chest and neck treatment made just for them. Includes malonic acid to help stimulate the production of healthy skin cells Used together, this clinically proven therapeutic system diminishes the signs of aging, helping revitalize vulnerable skin, contributing to more flawless, youthful-looking skin.